It was late 2015 when the owner of the SA Ranch (Eric) hit the wall on conventional agriculture and decided that something had to be done. After much research a path was chosen and the SA Ranch’s sustainable, but economically viable, agriculture project began in earnest in the spring of 2016. In March we retained the two Scientists (Elaine and Molly) who largely had defined the “path” as well as hired a ranch team to run all operations on site relating to the project. After our initial soil tests (see attached) proved definitively how the SA Ranch was basically empty dirt not soil, the mission became crystal clear, we had to fix the soil. Even prior to getting the soil tested our scientists were not confused about the task at hand. They could just look at the soil and know that the microbial community had been decimated. Healthy soil is full of microorganisms, up to 1 billon per teaspoon. If one creates a robust & self-sustaining microbial community – one will have healthy soil. The SA Ranch does not have healthy soil today. I recently watched the movie the Martian. Farming on Mars would require lots of fertilizer & Matt Damon figured that out. Northern dry land farming is not quite Mars but chemicals have killed the microbes. To get a crop, synthetic fertilizers combined with herbicides & pesticides are the norm. In contrast, if the soil was healthy (as we define it) there would be no chemicals needed to grow a crop. Interestingly, chemicals are approximately 70% of the cost structure in growing wheat. In our “fix the soil” program, if current wheat yields can be maintained (and they should be higher) the dramatically lower input costs would create a new paradigm in the economics of wheat production. The resultant chemical free and more nutritious crop would be embraced by producers and consumers. This is how the world would change (see the “declaration” tab on this web site) but first things first…to get the ball rolling our scientists’ first agenda was that we had to stop killing the precious few microorganisms left in the SA Ranch’s dirt (meaning no chemicals) and we had to jump start and rebuild the biology. Both Elaine and Molly give speeches all over the globe on this “health of the soil” topic with the punch line being that the most effective way to re-build soil is by spiking the ground with microbial rich compost. Unfortunately going to Home Depot and purchasing bags of compost was not an option; we just have too many acres to cover. Thus, out of necessity, we began gearing up to go into the “commercial” compost manufacturing business. In 2016, we are targeting to “fix” the soil on approximately 1,200 acres and to cover this much dirt we figure we need to make 2,000 tons of compost. For context, the SA ranch has approximately 2,500 acres of agricultural land in total (with another 20,000+ acres of natural grazing land). Given the goal is to “fix” all the land we will be covering an additional 1,300 acres with compost in 2017. In making compost, there is an optimal & location specific process that creates the right biology. 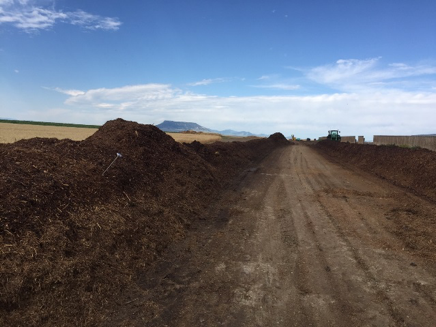 On the SA Ranch, our compost production is run by the ranch management team who consults with and works towards achieving our Scientist’s exacting biological compost standards. Their compost production program is a “how does the biology look” based system. The biology we are looking to end up with has to be consistent with the optimal biology that the local microbial community would develop in soil that nature managed without Monsanto’s help. With the overall goals in place, the initial months were spent formalizing our operating plan which developed into three main thrusts. Wheat in northern climates like Montana is typically grown one year and then the land goes fallow the next. Thrust #1 was to develop and plant a high bio-mass, diversified cover crop on all land scheduled to be “fallow” in 2016. 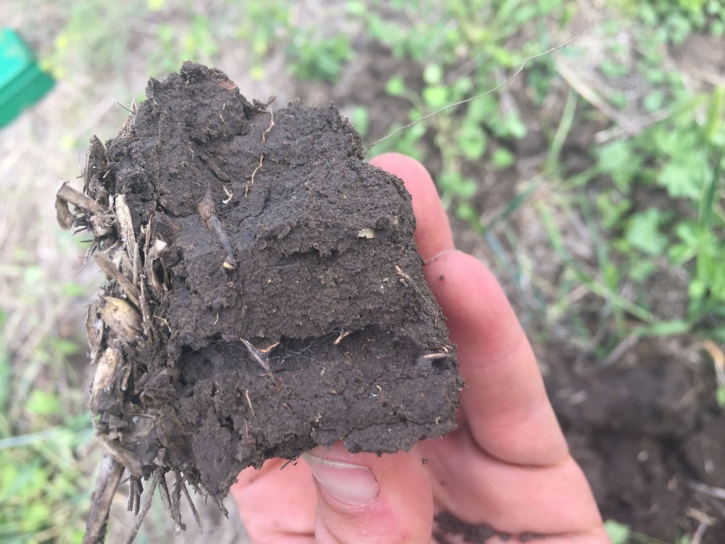 This approach gives the soil a “cover” of organic matter as well as stops the chemicals for in conventional farming the optimal fallow land is bare dirt. Weeds are a first succession crop and they love the lousy soil of bare dirt. The only way to keep the land “bare” is to spray with herbicides (e.g RoundUp) virtually every month. Why more cover crops are not planted versus spraying expensive poison is beyond me. Thrust #2 was to make a 1,000 of tons of compost by August and another 1,000 tons by September. 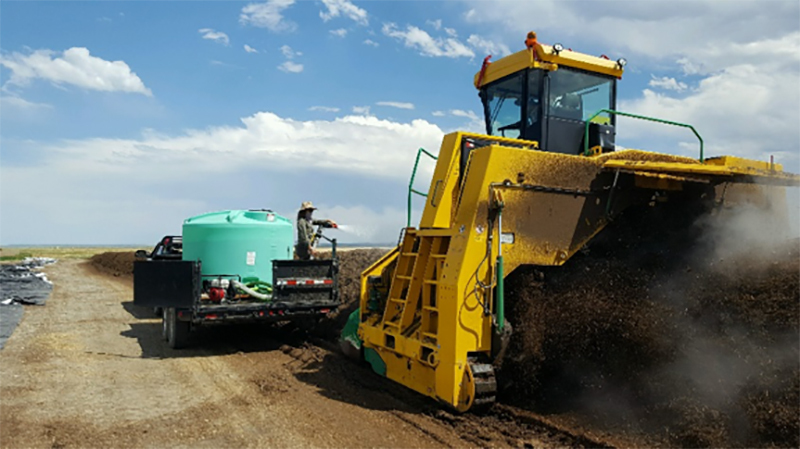 All 2,000 tons would be applied onto 1,200 targeted acres in the fall before winter hits central Montana. Thrust #3 was to attempt to put compost or compost tea on two small test plots and plant our “new” wheat and hay cropping program into these plots in the spring. The goal of these test plots is to see if our crop mixes were optimal and if the biology applied made a difference. On thrust #1, in May we planted a diversified cover crop mix into all the ground on the SA Ranch that had been scheduled to be fallow in 2016. This was an “annual” mix of plants that included turnips, radish, safflower, peas, sunflower and local cool season wheat & barley grasses. We decided to not spray any herbicides, pesticides or add any synthetic fertilizer to this crop and to just see how it would do in our tired dirt. The locals told us that without spraying, weeds would crowd out this cover crop but that is not what happened. We did have perfect weather in Montana this last spring and early summer also had great moisture. Our annual cover crop thrived and monopolized the fields. Even the locals commented on how there were no weeds. In late July and August we began harvesting this crop as hay (we had planted 800 acres overall). The cover crop kept chemicals off the land and will provide approximately 1.5 tons per acre of hay which we will use to both feed our cows this winter as well it will provide fabulous “green chop” material for our next big batch of compost. The SA Ranch has two distinct farming regions. It has land on the Square Butte Bench and land down on Arrow creek. Some of the diversified cover crop was down on the creek but most was up on the bench. Unfortunately, because we can’t get it all “fixed” this year, we will still do a bit of traditional (meaning chemicals) farming down on the creek in 2016 in the winter wheat fields. However, I am very happy to report that all the SA Ranch’s land up on the bench was chemical free in 2016 and it will be chemical free hopefully forever more. This is likely the first time in over 70 years that poison was not sprayed on the bench’s soil and as such it is the first time in 70 years that organic matter has a chance to rebuild in the soil for even though the diversified cover crop will be harvested, it will leave substantial organic matter in the field and the microorganisms have had a small window to re-build. It was our view that planting a diversified cover crop (like the mix we used) is the perfect transition crop to moving towards our sustainable agriculture model. The results we have seen thus far give strong credibility to this view. Thrust #2 was definitely more of a learning curve project than thrust #1 and we have been learning quickly. Composting is a biological process, carried out under controlled aerobic conditions (requires oxygen) that happens in nature everywhere on the planet. In the composting process, various microorganisms, including bacteria and fungi, break down organic matter into simpler substances that effectively turns a pile of plants or branches or anything organic into pure black soil. In making compost our scientists provided a basic recipe. However as nature proves, compost recipes are not an exact science so one has flexibility around material constraints. The “batch” we created was approximately 20% high nitrogen material (i.e. manure or alfalfa or sainfoin) with the balance being a mix of grasses (we used old grass hay), wood or stalky material like corn or wheat straw. Ideally, there would also be some “cut green” grasses or cover crop mix in the compost pile as well. When all is mixed together with the “inoculate” (which acts like yeast) and plenty of moisture the organic matter is metabolized by microorganisms and the cooking begins. As you can see in the pictures, the “pile” quickly heats up to 160 degrees or more (we have to turn it to control the temperature and keep the pile aerobic) quickly. The heat comes from the microbes decomposing all the organic material and the heat kills weed seeds and harmful pathogens while leaving high nutritional value. Once all is decomposed & pure the pile cools down and one is left with the ultimate rich soil teeming with microorganisms. When compost is put out on the land the microorganisms keep doing their “decompose build nutrition” thing and dirt turns into healthy soil. Our scientists tell us that humans could eat finished compost; we have not tried that yet. Interestingly to make pure compost one needs to start with the right local microorganisms in the inoculants. To get our original inoculants pile we hiked as far away as we could get from the chemical fields (including going the top of square butte which you can see in many of the pictures) and gathered soil from spots all around central Montana. 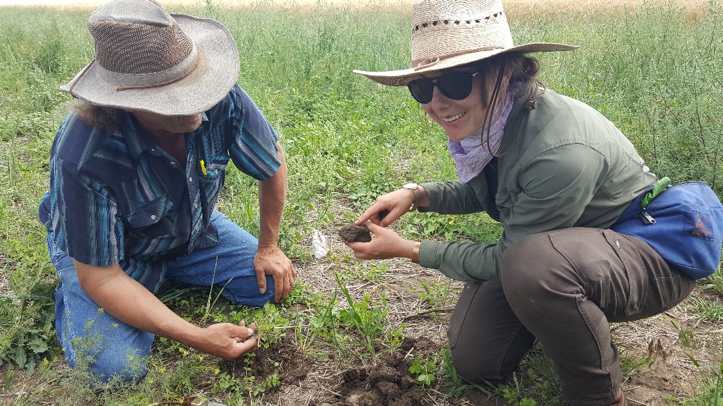 We created a minilab at the ranch’s headquarters and when our scientists were happy with the biology in our original “gathered soil” inoculants pile we began our first compost in May. Our first test pile, which was created in our storage sheds (tight controls), used all local ingredients and this was a small hand turned pile (you can see pictures of this in the “watch us transform” section of the website). We started two other piles in successive weeks where he applied real-time learning and experimented with material mixes and moisture. These piles all produced excellent compost and in fact, one of our earliest victories was when Elaine (head scientist) looked at the biology of our first compost pile. In the picture below you can see this happening real time with the team looking anxious and Elaine smiling. She is smiling because the biology is robust; our goal is to create this biology in our commercial compost operation. 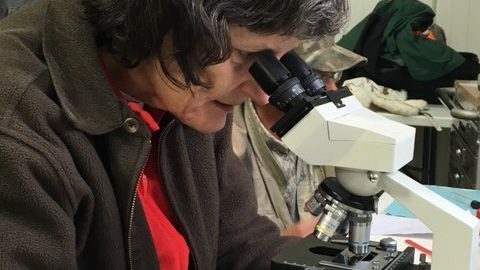 Elaine examining soil samples. She is smiling because the biology is robust; our goal is to create this biology in our commercial compost operation. 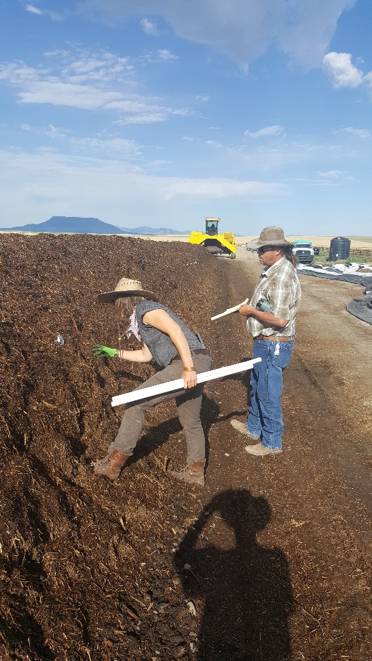 Making a small hand turned pile of compost is quite different than making 1000’s of tons of compost but with a mini-formula in hand, the ranch team spent most of the spring & early summer scouring the county for materials. We have a goal of making compost with all local, easy to acquire materials so that other farmers in the area can replicate our program. 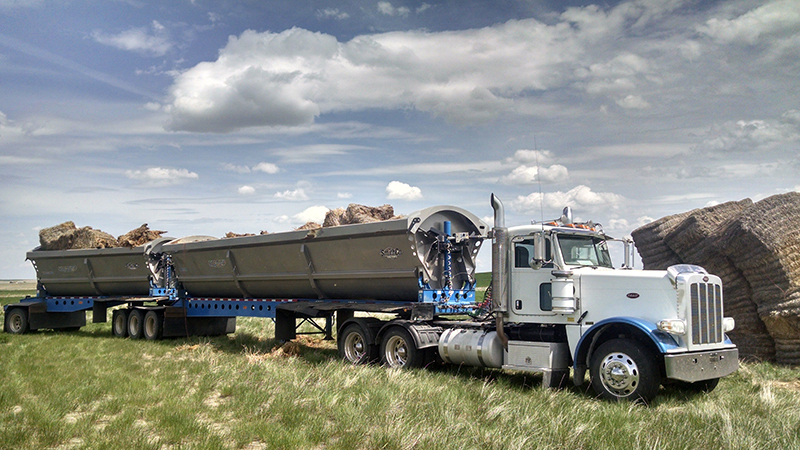 We purchased old hay (both grass-based and high nitrogen alfalfa) & wheat straw from ranches all over the area. Spring Creek Colony (a local Hutterite community) contributed manure from their dairy operation and we pulled in other organic materials, including old corn stalks, from other ranches. In addition to gathering materials, we purchased equipment to haul and chop materials as well as a commercial grade compost turner. We also re-purposed water trucks and commandeered pieces of green (i.e. John Deere) equipment and skid steers from the SA ranch as needed. On thrust #3 our intention was to put out compost and select/plant our wheat field’s perennial crop this spring on a 30 acre test site to test our long-term wheat growing program. 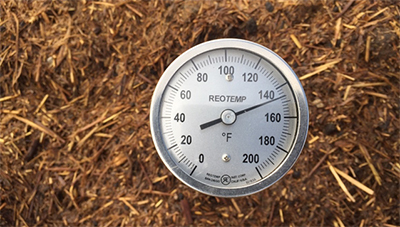 Additionally, we had hoped to get compost out and select/plant a diversified grass hay mix on another 50 acre test site to test our long-term hay growing model. Our long-term plan with both our wheat and hay fields is that we will always have perennial diversified plants (i.e. bio-diversity) in the soil. While compost is our main answer to create healthy soil, once soil is “made” the microorganisms need to be maintained. One of the key tenets of maintaining healthy soil is to have both bio-diversity and living roots in the soil at all times. It should be pointed out that while bio-diversity is nature’s absolute choice everywhere, bio-diversity is absent in most conventional farming practices, especially dryland farming in North America. We are really blazing new ground here especially in our wheat fields. In our wheat fields, our plan is to utilize our very effective “no-till” planter (tilling is brutal on microorganisms and this is one of our chief complaints with most “organic” growing programs) to plant a low, diversified perennial ground cover that will keep living roots in the soil at all times. Once the low perennial ground cover has “taken hold” we will again utilize our “no-till” equipment and plant winter wheat right into the ground cover in the fall. The wheat will be harvested it the following summer. The theory is that the wheat will grow taller than the “low” ground cover and we will harvest it leaving the soil with organic matter from the wheat stalks and the ground cover’s living roots. If we create and maintain healthy soil we should attain productive wheat yields without having to use chemicals or pesticides. Another game changer is going to be that we should be able to plant wheat every year in our fields’ versus the typical crop/fallow rotation (i.e. every other year they have a crop to sell) that chemical farming follows. In the hay fields we are also embracing bio-diversity (unlike most hay fields which are mono-cultures) and again will use no chemicals. This spring we did get both the perennial ground cover planted into the 30-acre wheat test site as well as the diversified hay field was also planted. Unfortunately, we were only able to get compost out on the 30-acre wheat test site. However, to be honest, the compost application we made (which was compost tea) was marginal at best for we did not have the right equipment to apply it effectively. Additionally, the tea was a packaged product approved by our scientists but our closely monitored homemade compost (and compost tea) should be much higher quality. In short, the application problem was that we tried to spray the compost tea with the farm’s chemical sprayer nozzles and the particulates in the compost tea plugged everything up. We have since fixed this application problem and while we will use a manure spreader to get the actual compost applied, we have a new robust tea brewing and application system that will be utilized this fall. However, in spite of the application issues, we did get some biology down and we have seen some real results in the short 3 months that the “tea” has been on/in the soil. In most “perennial” crops the results one sees above ground in year #1 are muted and that has been the case as it relates to what the plants look like in our two test fields as of late July. Having said that, they are tracking well for first-year growth and we expect them to take over next year. What we really care about, and what really matters is what is going on under the ground. The bottom line is that the soil in the test plot, which was sprayed with compost tea, is markedly improved versus the “dirt” everywhere else on the ranch. In late July, our scientist Molly was out working on our compost and testing it and our test plots soil for a full week. As it relates to the wheat test field, she was shocked at how quickly things had improved. Specifically, the soil in the compost tea applied test site already has amazing structure and the biology, while not complete, is blossoming (confirmed when we view it under the microscope). In soil terms, what “structure” means to the naked eye is that the soil has aggregates and clumps versus looking like blow away dust. One can go 10 feet into the conventional winter wheat field adjacent to the test site and grab a handful of dirt that is like dust. It is surprising that the conventional wheat fields are productive (we harvested 75 bushels per acre this year) given the state of their dust like soil (makes me wonder how productive it would have been with healthy soil) but no confusion, a simple visual “side by side” comparison of the test plot soil to the adjacent field’s soil shows readily apparent differences. The soil in the test site is already full of angle worms and it has deep worm passages and root nodules everywhere. Additionally, at the time we tested it in mid-July there was moisture down to 3 feet in depth. Yes, there had been recent rain but in the adjacent fields to the test site there were zero worms, no worm passages detected with our measuring devices, and we only could register moisture down 1 foot. We have a compaction instrument on the ranch and “compaction” of fields is a huge issue for compaction blocks moisture from going deep into the soil and leads to erosion. 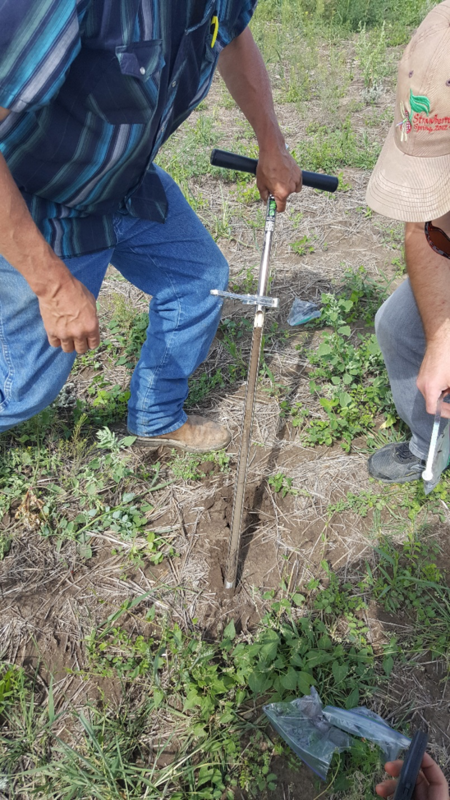 In the wheat test field, the compaction instrument did not hit 350 lbs of pressure until it was down 24 inches or more, in the adjacent wheat field it was no more than 6 inches of depth prior to hitting the 350 lbs of pressure mark. We also gathered soil from various depths to conduct carbon tests in both our test site field and other control fields. We are looking to establish base lines on carbon sequestration for we believe that our process will sequester substantial carbon (that was lost when these fields were repeatedly tilled). The attached link is an excellent discussion of carbon sequestration and what is lost through conventional agriculture but that topic will be addressed in future “updates”. In getting dirt for the carbon tests we used a special “core sample instrument” and took core samples down approximately 36 inches. Pushing the core sample instrument down in the wheat test site field was easy to do by hand. In the “control field” one could barely get the core sample instrument into the ground by hand and human effort could not push it down over 6 inches. 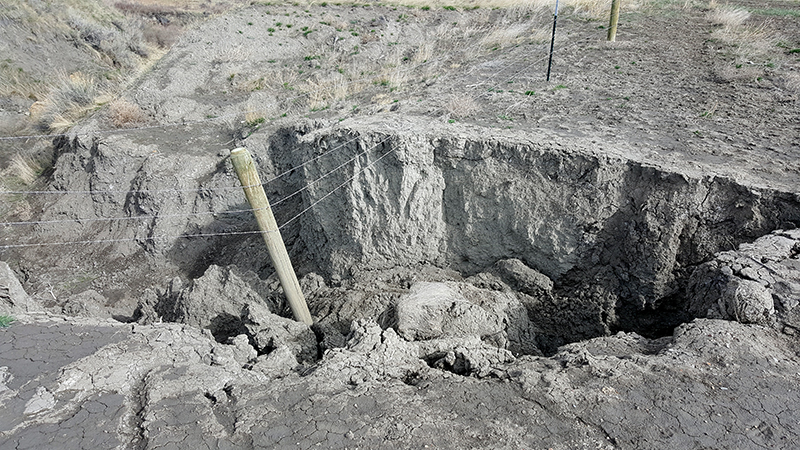 In fact, to get it into the ground 3 feet deep took a heavy post pounding tool (tool we use to pound in fence posts on the ranch) and over 50 hard hits with maximum force. Reducing compaction is one sign of improving soil. We are very excited by these early results of how our soil responds to small applications of compost. Conducting soil tests in the test wheat field. This fall we will be very busy in the SA Ranch. In addition to making 2,000 tons of compost, the team will need to apply this across 1,200 acres. To give you a sense of the activity required to accomplish this, a typical large dump truck carries 30 tons of materials meaning 66 full round trips without factoring in the “spreading” time required. We will plant winter wheat this fall into the 30 acre wheat test plot which will be a great test of our long-term wheat model. In the spring, Dave (ranch manager) will plant all 1,200 acres that received compost into our long-term wheat and hay programs which means planting the low perennial ground cover into the wheat fields and diversified grass mix into the hay fields. One year from now the SA Ranch will have many data points to review. Lastly, we have recently made the decision to move the SA Ranch’s 500 cow/calf pairs cattle operation under the umbrella of Wild Sky Beef. You can see all the principals behind Wild Sky at http://wildskybeef.org but basically, Wild Sky’s conservation and wildlife friendly focus is consistent with our agendas. I am not a fan of grass-fed beef generally but Wild Sky is finishing their “all grass fed” product at a Midwestern feedlot that has figured the formula out. The taste tests we have done have been convincing. Eventually, our hope is that the cattle raised naturally off the pure soil of the SA Ranch will be finished at Wild Sky approved feedlots. This would yield a healthy (totally non-GMO, non-chemical product) that consumers will be able to purchase directly under the Wild Sky/SA Ranch brand. We have some lifting prior to this being a reality but it is in motion. Follow our progress! Signup for our email news.